Peter gained his MSc in Hydrogeology at Birmingham University during the early 1980s, becaming a member of IAH soon afterwards. With specialisms in water-resources management, hydrochemistry, groundwater irrigation, and WASH in specific, Peter has worked overseas for many years on development projects in Europe and the Cayman Islands, India, Bangladesh, Indonesia, Iraq (Kurdistan), Oman, Pakistan, Thailand, Uganda, and Yemen. The work has done much to improve the livelihoods of the rural poor in these countries, especially Bangladesh. In his early career with Mott MacDonald, AMEC, EDF-CEIDRE, and Arcadis Geraghty & Miller International, Peter worked on case studies, design, implementation, evaluation, policy, legal and institutional issues, rising to be Principal Hydrogeologist for AMEC. Peter has worked mostly on water resources management, water law and institutions, water supply, and water quality. Within these broad fields he has been active in case studies, design, implementation, evaluation, policy, legal, and institutional issues. His emphasis since 1997 has been on serving the developing world by service to their governments, UNESCO, UNDP, the World Bank, NGOs, communities, and individuals amongst the rural poor. 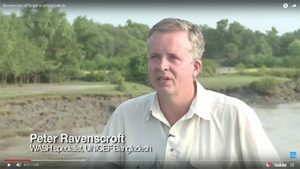 In the recent past he has lead and managed programmes for UNDP, UNICEF in supporting WASH activities for Syrian refugees in Iraqi Kurdistan, and UNICEF in Bangladesh implementing WASH programmes and leading its arsenic mitigation programme, and advising on drilling water-wells for Rohingan refugees. Much of Peter’s work has been undertaken with the dual aims of understanding and addressing the issue of arsenic-pollution of groundwater in SE Asia, especially in Bangladesh and adjoining West Bengal, and of helping Bangladesh develop its infrastructure of water management and supply. Peter secured a programme of retesting for arsenic, redrilling of some bad wells, and a change in drilling contract so that drillers were paid for each well installed whether it proved good or not. Thousands of rural poor benefitted by (eventual) provision of arsenic-free water from this one act alone. Whilst working as a consultant, he has also found time to write books and many research papers. His book “Arsenic Pollution” is the standard text on the subject and his edited book “Groundwater Resources and Development in Bangladesh Groundwater in Bangladesh” is also used widely as a source book. Peter has also reviewed many times for international journals as wells as for publications of UNICEF and the World Health Organization. In 2005, he was head-hunted by a donor to Cambridge University to spend 18 months in its Department of Geography as a Research Associate to research the causes and impacts of, and solutions for, the problems of arsenic pollution of groundwater worldwide. Outputs included a book and an international conference. Peter’s expertise on the arsenic pollution of groundwater has been further recognised by his acting as co-convener of an international conference on arsenic in groundwater (Royal Geographical Society, 2007) and by accepting invitations to speak at international conferences e.g. the ‘Southeast Asia Regional Conference on Groundwater Arsenic’ held in Hanoi in November, 2017; where his keynote presentation was entitled “Science and Practice: Lessons Learned from Arsenic Mitigation in Bangladesh and West Bengal”. Noting his substantial and practical efforts that have contributed to improvements in living standards, IAH is delighted to present the Applied Hydrogeology Award this year to Peter Ravenscroft.